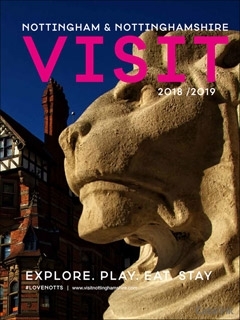 To pre-order a printed copy of the Visit Nottinghamshire brochure, simply click the order button below and one will be sent to your registered address. Rousing stories of rebellion and virtue are written into the DNA - visit the enchanting Sherwood Forest to walk in the footsteps of Robin Hood, learn of castles torn apart by civil war, or enjoy a cocktail in one of the city's cave bars. You can even trace the daring footsteps of the Mayflower Pilgrims from Nottinghamshire to the Americas, before learning how Nottinghamshire innovations like MRI scanners have helped change the world for the better. Pre-order the Visit Nottinghamshire Brochure now for a UK visit that's perfect all year round. Visit Nottinghamshire AVE B. said: It is an interesting place which I may well visit inthe near future. Visit Nottinghamshire Marcia B. said: very good information about Nottinghamshire. Visit Nottinghamshire Clare H. said: Nicely laid out.